M. Aufidius Rusticus was one of the moneyers for the year 140 BC. He is not otherwise known. Gens Aufidia was a plebeian family at Rome, which is not known until the later times of the Republic. The first member to obtain the consulship was Gnaeus Aufidius Orestes, in 71 BC. 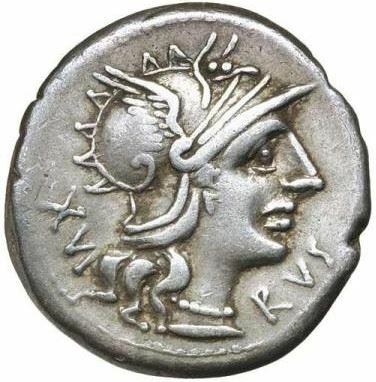 In Republican times, the Aufidii used the praenomina Gnaeus, Titus, Marcus, and Sextus. Lucius and Gaius are not found prior to the second century AD. The character Tullus Aufidius in Shakespeare's play Coriolanus predates the earliest historical mention of the gens by some three hundred years, and is identified as Attius Tullius in Livy; there is no other evidence that the praenomen Tullus was used by the Aufidii.